Previous material on the history of Rookwood dealt with the preparations for the sale of the house in July 1917 using the prospectus prepared by Stephenson and Alexander, Auctioneers and Chartered Surveyors of High Street, Cardiff. In this article we pick up the threads of what happened next and celebrate the establishment of the first hospital at Rookwood in 1918, 100 years ago. The records for Stephenson and Alexander held at Glamorgan Archives confirm that strenuous efforts were made to sell the house and the estate in the summer of 1917. On two occasions a sale was close, with well-known figures in the local business world showing interest. However, in each case, they were deterred by the valuation of £20,000 placed on the house and the estate by the Hill family. The sale may not have been helped by the fact that Rookwood had been unoccupied for some time. Sir Edward Stock Hill had died in 1902 and, by 1917, Lady Hill and her eldest daughter Mabel were living in Charlton Kings, Gloucestershire. Mabel’s siblings were mostly married and also living in England with the sale being handled, primarily, by her brothers Eustace and Vernon, both living in the Bristol area. The Rookwood estate had, therefore, been mothballed, with much of the furniture moved to family homes in England. Records suggest that two members of staff were employed to care for the house. In addition, the gardens were tended by the head gardener, Duncan McIntyre, with one assistant. It may have been a ruse to beat down the price, but several interested parties complained that the house and gardens needed attention and that the price did not take account of …the outlay which would have to be made in improving the residence. It was at this point that Maud Purnell first appeared in the records. In the latter months of 1917 Stephenson and Alexander were commissioned by the Hill family to begin to sell the remaining contents of the house. 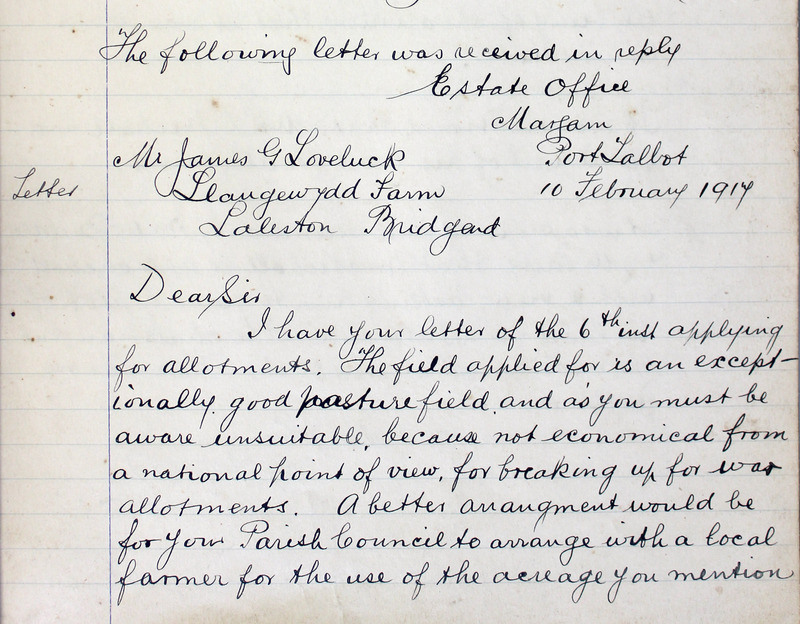 After the sale, Lady Hill wrote to the auctioneers expressing her disappointment with the £355 raised and the ongoing failure to find a buyer. It must have been a relief to all concerned when, in February 1918, a letter was received from Maud Purnell of Weybridge, Surrey enquiring whether the house could be leased for use as a hospital for the duration of the War. Maud Alice Purnell was a force to be reckoned with. Although living in Surrey with her husband, Ivor Purnell, an architect, she was the eldest daughter of Philip Morel. With his brother, Thomas, and brother in law, John Gibbs, Philip Morel was the founder of the Morel shipping line, one the biggest and most valuable fleets operating from Cardiff in the latter half of the 1800s. The Morel family lived primarily in the Penarth area and, with her first husband, Francis Hibbert, a Corn Merchant, Maud was a well-known figure in south Wales. She figured regularly in local newspaper reports in connection with her church and charity work, including the provision of £1000 in 1908 for a bed at the Royal Hamadryad Seamen’s Hospital in memory of her father who had died that year. Maud had married Ivor Purnell in 1913 after the death of her first husband and, on the outbreak of war, she had thrown herself into work for the Red Cross. With the siting of the 3rd Western General Hospital in Howard Gardens, Cardiff was a major centre for the receipt of wounded brought by boat and rail from France and Belgium. As a result there was a need for satellite auxiliary hospitals where those discharged from the military hospitals could be cared for while they convalesced. This was a role taken on board by the Red Cross using local volunteers referred to as VADs (Voluntary Aid Detachments). In Glamorgan alone during the course of the war there were 48 Red Cross Hospitals. On marrying Ivor Purnell, Maud had given her address as Lavernock House, Penarth. Many of the auxiliary hospitals were large houses loaned or rented to the Red Cross and Maud Purnell was certainly involved with, and probably ran, the Red Cross hospital at Lavernock House that catered for non-commissioned officers and other ranks. However, by 1918 Lavernock House was required by the authorities to provide extra beds for patients at the King Edward VII Hospital in Cardiff. Mrs Purnell, therefore, was looking for suitable premises to establish a new hospital. In a letter to Stephenson and Alexander, dated 15 February 1918, she demanded a quick decision on her application for a lease. She also side stepped the usual conventions by asking that a second letter be passed direct to Lady Hill setting out her request. Of course I am leaving it to Mr Alexander to arrange any reasonable rent but I am writing this to assure you that in the event of our coming to terms I should be living in the house in entire charge myself and am bearing all the expenses, except the Army grant per Officer. I will be responsible that no damage shall be done at all to your very beautiful property [letter of 15 February, ref. : DSA/12/2933]. The letter was signed Maud A Purnell, Hon Commandant. The very first Hospital at Rookwood was, therefore, to be a Red Cross hospital but reserved exclusively for the care of officers. Although the Hill family hoped for a sale, when told that Mrs Purnell would not buy ‘at any price’ they relented. 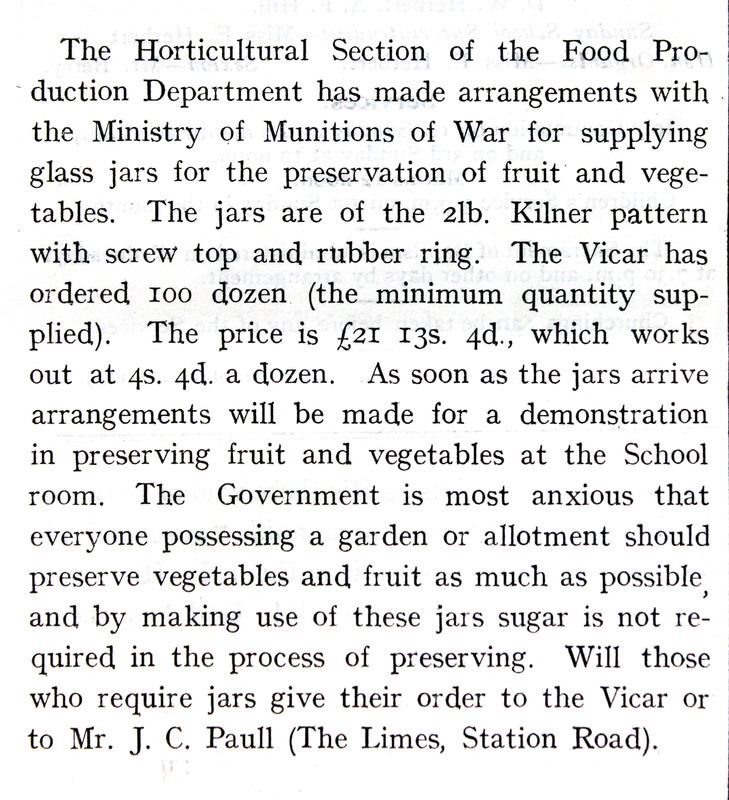 By 8 April the terms were concluded with Mrs Purnell securing the lease for her hospital for £500 a year for an initial 12 month period, and with an agreement that the lease would end 6 months after the end of the war. As the tenant, Mrs Purnell took responsibility for the maintenance of the interior of the house and also for the surrounding grounds, kitchen gardens, stables and lodges. She also inherited the services of Duncan MacIntyre, the head gardener, who lived on the estate at Rookwood Lodge. This was probably something of a coup, for Duncan, originally from Kilmartin in Argyle, and his wife Lizzie had worked for the Hill family for nearly 20 years. As Head Gardener at Rookwood he was a respected local figure who often acted as a judge at horticultural shows in Cardiff and the Vale of Glamorgan. Although stripped of many of the staff that Rookwood would have employed to tend the gardens in their prime, no one was better placed to maintain the estate. Mrs Ivor Purnell of Penarth has rented Rookwood, Llandaff formerly the residence of Lady Hill for the period of the war and it will shortly be opened as a hospital for officers….Rookwood contains something like twenty bedrooms and if all the accommodation that it provides be utilised it will afford room for not far short of 100 beds [Western Mail, 30 April 1918]. It has to be remembered that, until the autumn of 1918, the war was still very much in the balance. The German assault in France and Belgium in March and April had thrown the Allied forces back in disarray and casualties were high on both sides. The wounded, therefore, were still streaming into Cardiff. As to the decision to set up a hospital exclusively for officers, it was accepted practice to care for officers separately and, no doubt, the arrangement helped to smooth the negotiations with the Hill family. In addition, the extra weekly premium paid for the care of officers would have helped to balance the books. The Red Cross Society Museum and Archive in London does not hold specific records for Rookwood. However, the Stephenson and Alexander records come to the rescue, in that work on the house had to be agreed with the Hill family. The house was evidently in a poor state of repair. In a letter to Stephenson and Alexander, Ivor Purnell noted …a considerable amount of the wall papering is in very bad condition… and it was proposed …to strip or distemper over where necessary for cleanliness. 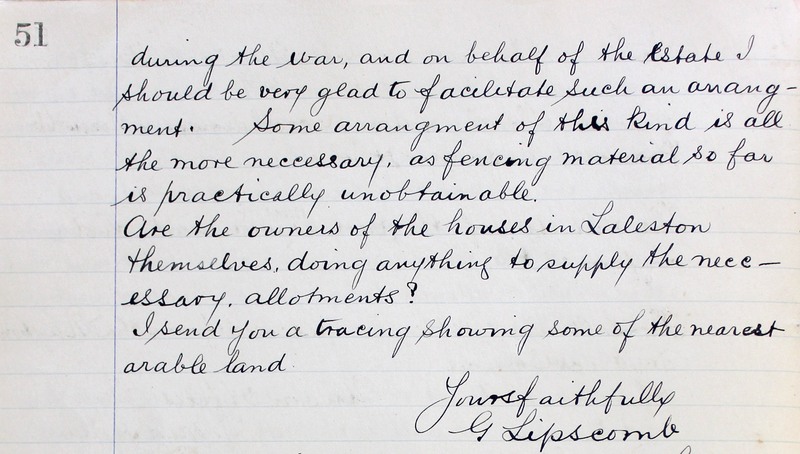 In addition, changes were made to the first floor with new bathroom accommodation put in place and additional toilets added on the ground floor [Letter from Ivor Purnell to Stephenson and Alexander, 30 March 1918, ref. : DSA/12/2933]. Beyond this, the house remained essentially intact with boarding put over a number of items of value, including the mantelpiece in the drawing room. In addition, the electric chandelier, the brass framed mirrors, the marble statue of Clytie and the brass fire curb in the drawing room remained, at the owner’s risk, until they could be sold or removed. Mrs Purnell’s lease ran from 8 April 1918 and it is likely that the hospital was up and running by late April. Anyone visiting would have been confronted with the formidable figure of Mrs Purnell in her red Commandant’s uniform supported by a quartermaster, matron and cook. The hospital would have been staffed, primarily, by volunteer Red Cross Nurses trained in first aid and home nursing. Beneath their starched white aprons, marked with the Red Cross, they would have worn blue dresses with starched white collars and linen oversleeves. By 1918 styles were changing and it was agreed that the hem of the skirt could be as much as 6 inches above the ground. Many would have been recent recruits from the locality but those with previous experience in military or naval hospitals would have been recognised by stripes worn on their right sleeve. Transport and stretcher work was generally carried out by male volunteers again dressed in blue military style uniforms. Not everything, however, went smoothly. On 16 May 1918 the Western Mail reported that Mrs Purnell and Ruth Hibbert …were summoned at Cardiff on Wednesday for using a car in Cardiff in contravention of the Petrol Restriction Order. In her defence, Mrs Purnell claimed that she was on official business taking one her nurses, Miss Ruth Hibbert, home. However, Ruth was no ordinary nurse. She was Mrs Purnell’s daughter by her first marriage. The authorities were not convinced by her story and Maud Purnell was fined £10 while Ruth Hibbert was cautioned [Western Mail, 16 May 1918]. What then of the ‘Llandaff Knuts’ mentioned earlier? There is a photograph held at the Glamorgan Archives that may well be the only photographic record of the Rookwood Red Cross Hospital. It shows five servicemen facing the camera and the picture is captioned the ‘Llandaff Knuts, April 1918’ [ref. : DX308/2]. The five men are in the standard issue uniforms worn by soldiers when in hospital – blue jackets with white lapels and lining, white shirt, red tie and regimental caps. Only one of the men is identified, John Swallow, sitting on the left at the front. The evidence is not conclusive but it is likely that the five were part of the first batch of officers cared for at Rookwood. The term ‘knut’ came from a well-known song at the time ‘Gilbert the Filbert’. It had been ‘amended’ and adopted by soldiers as a marching song and the term ‘knut’ was used for ‘young men about town’ – dandies. It sounds, therefore, that the men were in good spirits as they took up residence at Rookwood. By mid-October Rookwood had been sold for a price close to the Hill family’s initial valuation. The sale, however, was required to take account of Maud Purnell’s lease. We have to assume, therefore, that the Rookwood Red Cross Hospital for Officers remained in place until April 1919. This may have suited all parties for, following the signing of the Armistice on 11 November 1918, the need for auxiliary hospitals was reduced. However, while the Red Cross Hospital was being wound down, the next phase of Rookwood’s life, also as a hospital, was already in the planning with the sale of the Rookwood estate to Sir Laurence Philipps. This is one of a series of articles about events at Rookwood from when it was built in 1866 through to modern times using records held at the Glamorgan Archives. The information used for the Rookwood Red Cross Hospital draws primarily on the records of Stephenson and Alexander, Auctioneers and Chartered Surveyors, ref. : DSA/12/2933. From the records at Glamorgan Archives we know that the owners of Rookwood in Llandaff put the house and estate up for sale in 1917. But who were the owners and why did they decide to leave Cardiff? Light is thrown on both questions by records held at Glamorgan Archives, including a set of family scrapbooks compiled by the Hill family over almost a 40 year period (ref. D1372). What better opportunity to meet the owners of Rookwood than at the first major wedding held at the house when Constance Hill, the second daughter of Sir Edward Stock Hill, married Walter Robertson Hoare. The Hill family scrapbook captures the event in a series of photographs and newspaper reports for October 1897. At the time Sir Edward Stock Hill, the owner of Rookwood, was one of the best known figures in south Wales and the west of England. A partner, with his brother, in Charles Hill and Sons, shipbuilders and ship owners of Bristol, Edward had come to Cardiff to supervise the acquisition and improvement of a graving dock and shipbuilding yard on the west side of the east Bute Docks. He built Rookwood in 1866, the year that he married Fanny Ellen Tickle. Although they kept an estate in Somerset, Edward, Fanny and their 7 children lived primarily at Rookwood. In 1897 Sir Edward had numerous strings to his bow. Alongside a successful business career he was the Member of Parliament for Bristol South, Lieutenant Colonel of the Glamorgan Artillery Volunteer Corps and High Sheriff of Glamorgan. Constance was the first of his three daughters to marry and it was a lavish affair. The ceremony took place on Thursday 28 October 1897, but the festivities started two days before when the family threw open the house and grounds of Rookwood to the people of Llandaff for a grand tea party hosted in the conservatory. The following night a party of 50 family and friends dined and were entertained by the Hills at the house. It is just possible that the ten servants employed in the house at Rookwood were able to cope with the arrangements for the tea party and dinner. However, the staffing must have been significantly augmented on the day of the wedding when two hundred and fifty guests were invited to the service at Llandaff Cathedral and the reception that followed at Rookwood. Pride of place on the guest list was given to Lord Halsbury, the Lord Chancellor and his wife. The list of those attending read like an A to Z of who’s who in south Wales with family names such as Bruce, Cory, Brain, Crawshay, Insole, Lindsay, Mackintosh, Vachell, Windsor and Turbervill. Although they did not attend on the day the powerful and influential Bute family sent presents. Constance was no shy retiring young woman when she married at the age of 29. She played an active role alongside her parents in local politics, building up the membership of the Primrose League in Cardiff, an offshoot of the Conservative Party. In addition, she was a key figure and organiser in south Wales for several major charities and, in particular, the NSPCC. She had also travelled widely both in Europe and north Africa and had been presented to Queen Victoria at Court. Like her sisters, Constance was a talented musician and an actress. Newspapers carried reviews of her performances in amateur productions in theatres in England and Ireland. Her father and four brothers were well known cricketers. Not to be outdone, Constance, who was talented with bat and ball, had captained both the Fairwater and Glamorganshire ladies cricket teams, on one occasion top scoring for the county with 56 runs in a match against East Gloucestershire. The best man and Constance’s brothers, Eustace, Vernon, Roderick and Percy, were fully employed in directing the guests to their places in the cathedral. Nothing had been left to chance. In case of rain covered arcades had been erected from the road to the church doorway, each decorated with evergreens and white flowers. The bride and her father arrived at the west door of the cathedral ‘punctually’ at half past two and processed down the main aisle on a crimson carpet laid for the occasion. The service was conducted by the Lord Bishop of Llandaff supported by the Rev Arthur Hoare, the bridegroom’s father. It would have been an impressive sight, with the cathedral decorated with lilies of the valley, white heather, ferns and palms. In addition, a large section of the cathedral had been set aside for the public and every seat and standing space had been taken an hour before the ceremony, while hundreds of well-wishers stood outside at the west door. As Constance and Walter drove back to Rookwood the streets from the cathedral were decorated with flags and bunting. At intervals along the route, ‘triumphal arches’ had been erected across the road, each woven with evergreens and flowers and dressed with streamers. Each arch carried a motto, including ‘Happy May They Be’ and ‘God Bless You Both’. To add to the effect and, as befitted a military family, cannon were fired at intervals, no doubt by the Glamorgan Artillery Volunteer Corps. The couple entered Rookwood estate through an arch erected at the gate house on Fairwater Road embroidered with two hearts with the initials C and W. Their first duty was to receive their guests and for this the couple stood in the Drawing Room under an artificial floral bell, emblematic of luck, and composed of white chrysanthemums and lined with white silk. There are no records of the fare served that day but Rookwood was well known for holding lavish garden and dinner parties. There are details, however, of the wedding cake. It was made by a Messrs Stevens of the Dorothy, Cardiff and was similar to a cake that the company had provided for her Highness Princess Henry of Pless. A sketch in the Western Mail confirmed that it was an ornate affair decorated with natural flowers and with panels representing Llandaff Cathedral and Sir Edward’s estates at Rookwood and Hazel Manor. There is little doubt that nothing was spared in catering for the guests at Rookwood on the wedding day. There is a photograph of many of those attending standing carefully posed by the doorway to the house. It features around 100 people and may, therefore, have been limited to family and honoured guests. Sir Edward Stock Hill is seated next to the groom and his wife is four seats to the right of the groom. Lord and Lady Halsbury, as might be expected, are in the foreground seated between Sir Edward and Lady Hill. Although the gowns worn by the women were reported in detail in the press, little was said about the men. From the photograph we can see that long frock coats were very much the order of the day for men at affairs such as this. The reception was probably over far too soon for many, with Walter and Constance Hoare leaving Rookwood at 4.30 to catch the evening express from Cardiff to Cornwall. By now Constance had changed and was reported as wearing a green cloth skirt, Russian blouse, pink and green broche and green velvet toque trimmed with pink velvet. As was the custom at the time the newspapers carried a full list of the wedding presents. Pride of place probably went to the diamond necklace and gold watch given by Sir Edward and Lady Hill to the bride and groom. It is a fascinating list that contains many items unlikely to figure on wedding lists these days, including a letter weighing machine, an embroidered blotter and two sets of muffineers. Let’s hope that the couple were keen ornithologists for they received three sets of books on the Birds of Britain. Finally, no one was excused from the list and it was reported that the servants of Rookwood had presented the couple with a silver salver and toast rack. This is one of a series of articles about events at Rookwood from when it was built in 1866 through to modern times drawing on records held at Glamorgan Archives. The scrapbooks compiled by the Hill family of Rookwood can be found at the Glamorgan Archives, reference number D1372. Rookwood Hospital in Llandaff is well known to residents of Cardiff and in 2018 it celebrates 100 years since the property was first used as a hospital. Less is known, however, about the house as a grand and opulent family home prior to its conversion to a hospital. 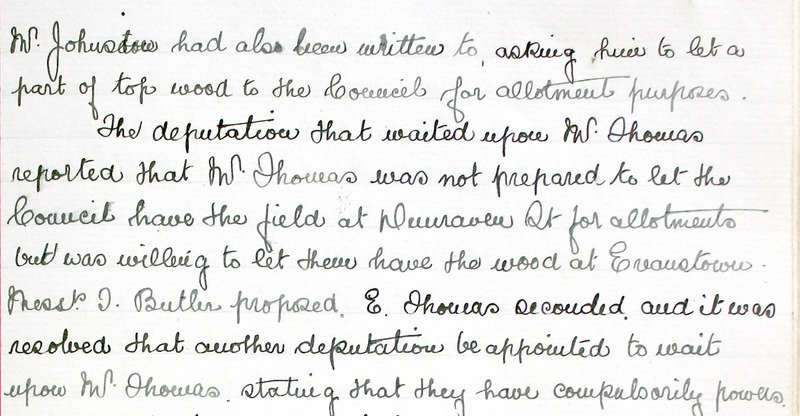 Several sets of records at Glamorgan Archives help to fill in the gaps prior to 1918 and provide an insight into the house and the family that built and lived at Rookwood from 1866. The records of Stephenson and Alexander, Auctioneers and Chartered Surveyors of High Street, Cardiff provide a useful starting point in looking at the history of Rookwood. They include papers that provide a fascinating glimpse into what would have been one of the grand houses of Cardiff at the turn of the 19th century. In 1917 Rookwood, then still a family home, was put up for sale. Stephenson and Alexander were charged with handling the sale and they produced a prospectus for potential buyers with full details of the house and the estate along with a number of photographs. The records also contain background information, not used in the brochure, with additional photographs and details of key items of furniture. In all, the material compiled by Stephenson and Alexander helps to paint a detailed picture of the house in the summer of 1917. Set in 26 acres of land, the estate occupied an area between Fairwater and Llantrisant Roads. By 1917 much of the outer rim of the estate had been turned over to pasture but, at the centre of the estate, there was still 9 acres of woodland and gardens. Having set the scene we are then provided with a room by room tour of the house and estate buildings. The estate could be approached by carriage drives from either Fairwater or Llantrisant Roads with, in each case, a substantial ‘artistic lodge’ built at the entrance to the estate. On arrival guests would have drawn up outside the imposing arched entrance to the south front of the house provided by a Port Cochere that can be seen in the first of the photographs in the folder. The front of the house with its turret and stone bay windows was designed to impress and almost certainly hit its mark with visitors. Photographs of the entrance hall with its teak doors and the drawing room provide an invaluable record of how the interior of the house would have looked in 1917. It was no coincidence that the entrance hall had its own fireplace. For some that may be as far as they were allowed to venture but, even then, with its painted walls and ceiling there was no mistaking that you were in grand house. There were some 35 pegs on the teak cloak stand and they would have been fully used given that the owners frequently threw large garden parties and evening musical soirees. For those invited past the threshold, the drawing room, with its heavily patterned wall paper and carpet, was the focal point of the house. It was a room to be admired and also a room that had to passed through in accessing many other areas of the house. From the photographs in the prospectus we can see that, in accordance with the style of the day, the Drawing Room had an array of ornamentation including ceramics above the highly decorated fireplace, with an iron and brass grate, along with photographs and paintings on the wall. Interestingly, just to the left of the fireplace there is a frame with 9 portrait style photographs almost certainly of the owners and their seven children. But more of the family later. The background notes compiled by the auctioneers confirm that all of the rooms had electricity and the drawing room was lit by a highly ornate Venetian glass chandelier, referred to an ‘Electolier’. Purchased at the famous glass makers, Salviati of Venice, it would have provided an imposing centrepiece to the room alongside the brass mirrors on the walls and the marble figure of ‘Clytie’, a water nymph from Greek mythology. In addition, one of the two Broadwood pianos owned by the family, probably the grand piano, would have been in this room. The owners were a musical family and the drawing room would have been used frequently for evening entertainment with both family and professional performers. So the tour continues on the ground floor through the dining room, the billiard room, the library with its walnut book shelves, the small smoke room and Camellia House …built of teak with panels of Mosaic, glass and tile roof and two doors leading to the Garden and verandah. Finally, as part of the ‘back premises and domestic offices’, there was a large kitchen, scullery and servants hall. Separate from the house there were two stables, two coach houses and a saddle room. Although the coach houses had been converted to hold motor vehicles by 1917, the records confirm that they still held a four wheeled Landau, a reminder of how the family would have travelled though Cardiff by carriage not so long ago. The house saw many eminent guests including a Lord Chancellor and Field Marshal Earl Roberts, hero of the Afghan campaigns and the Boer War. Those staying with the family would have been swept up the imposing central teak staircase to the first floor where they would have found, for family and guests, five double bedrooms, including four with adjoining dressing rooms, a nursery and seven single bedrooms. A house such as this required a significant number of staff. Records for 1891 confirm that at least 10 staff were employed in the house alone. On the second floor six staff bedrooms were provided, in addition to the accommodation for the butler and housekeeper on the ground floor adjoining the kitchen. The butler was charged with the security of many valuable items and his pantry was equipped with a Cartwright safe over 5ft high with 3 shelves and 3 drawers. Even so, there would not have been enough space for the house staff, and there were further bedrooms for a maid and footman on the ground and first floors. The two estate lodges would have been reserved for the more senior staff, with one allocated almost certainly for the Head Gardener. The prospectus confirms that the lodges, at least from the exterior, were significant and ornate buildings. Stephenson and Alexander described the Lodge on Llantrisant Road as …an artistic half-timbered House with red tiled roof and leaded casement windows …contains five rooms and pantry, has water laid on and good kitchen garden adjoining. The role of Head Gardener carried a great deal of responsibility leading a team of gardeners, probably drawn from the local area rather than living on the estate. The gardens were used frequently by the family for parties and events and would have been familiar to many of the local families including the Insoles, Brains, Crawshays, Corys, Courtis and Mackintosh. Again the photographs help to provide an impression of the estate, with views of the tennis and croquet lawns, summer house and a garden walk. The detail in the prospectus, however, underlines just what a formidable task this must have been. The gardens consisted of three distinct elements including two extensive kitchen gardens. The prospectus describes just one of the kitchen gardens as having …a long centre board walk, Summer House and arbour spanned by rose arches, flanked by deep herbaceous borders and planted with wall and standard fruit trees of all descriptions in full bearing. The bush trees are enclosed in a wire netting fruit cage on iron supports. In addition to a second Kitchen Garden, there were also two orchid houses, a tomato house and two greenhouses. Beyond the kitchen gardens a second area of land was styled as …the Pleasure Grounds. This included a large rose garden, lawn areas, rose and tulip gardens with boxed edge paths and a woodland area with …remarkable specimens of conifer and other trees including Wellingtonias, Cedars, Lime Beech and Elm. The third area, the park land, had been largely let as pasture by 1917, bringing some relief to the Head Gardener’s role. All in all, maintaining the estate would have been a considerable undertaking. As a sign of the times much play was made in the prospectus that Rookwood was … fitted with modern conveniences, including its own Electric light, modern Drainage, Cardiff Water and Gas. Indeed the prospectus went into detail on the National Gas Engine and Compton Dynamo fitted in the purpose made Electric Light Power and Storage House. However, the prospectus also carefully identified areas of estate that could be sold off while maintaining a core of the house and its ornamental and kitchen gardens. It is likely that the hardships resulting from the war were making estates, such as Rookwood, increasingly financially unviable. Many thanks to Keith Edwards for his invaluable assistance in identifying the documents used in this article from within the Stephenson and Alexander collection. Prior to the outbreak of the First World War the British Army and Navy were professional forces consisting of men who joined the military as their chosen employment. However, as a result of the catastrophic number of casualties sustained in the initial months of the War, the British Army was too small in numbers to contain the threat of the large German forces. In 1915 a campaign was launched by Lord Kitchener, Minister for War, to encourage men of military age to volunteer. Amongst these volunteers were men who did not wish to serve immediately, but who instead took an oath promising to serve at a later date when summoned. They were classed as ‘Attested Men’. This scheme left the Army with a pool of committed men to call on, if and when needed. The individual ‘attested men’ were each given an armband to wear, signifying that they were prepared to serve and do their duty. This relieved much of the pressure which young men at the time must have felt, enabling them to live within their communities without the shame of ‘white feathers’ which were distributed to those alleged to be cowards. Another category of men who didn’t volunteer in the early years of the War were those in occupations required for the war effort, often those working on the land or in heavy industry. There was a further small group of men who were eligible to be conscripted but claimed exemption on moral and religious grounds. These individuals were classed as conscientious objectors. They became widely ostracised because of their stance of refusing to fight. Only a small number of conscientious objectors were exempted from service absolutely. Many were obliged to serve in non-combat roles. 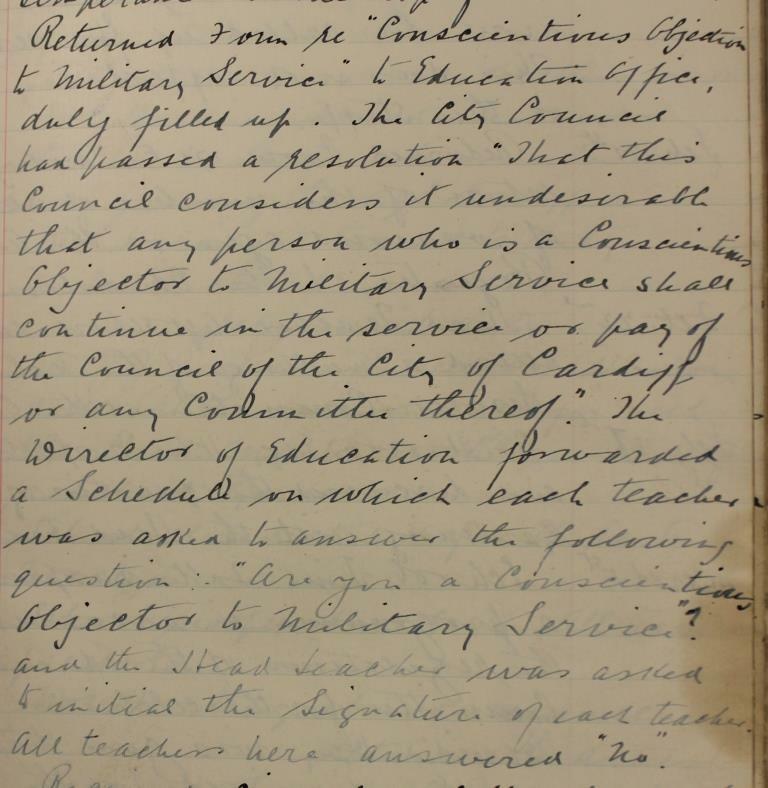 Few records of conscientious objectors survive, although some can be found at the National Archives (www.nationalarchives.gov.uk) and some at local archives services such as those held by Glamorgan Archives. Details of many of the local tribunals will be recorded in newspapers from the time.